Whether you are entering the exciting world of ukuleles, considering buying a ukulele, or want to know more about your instrument, you've come to the right place. We have all the info on the classic soprano ukuleles. What do I need to know about soprano ukes? Soprano ukes have been termed the "classic ukulele." They have the "plinky" sound most people associate with ukuleles. This is because they have a smaller body than a guitar or a baritone and tenor ukulele. 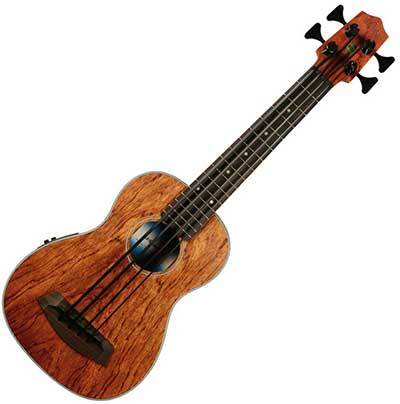 These popular ukes are usually about 14 inches, but can come in even smaller sizes. The size isn't determined by the the length, but by the distance between bridge and the nut (also known as scale length). The length is usually about 21 inches, but again this depends on the manufacturer. The dimensions of the soprano ukulele are what equal a standard sized uke. Due to the petite frame of soprano ukuleles, they are known for being easy to carry and travel with. ​Plus, they are usually less expensive! A good beginner's soprano ukulele is the Lanikai LUTU 21-S. ​This is a good entry level uke and the price is reasonable for the investment you're making. Plus, you can tune it without tools! That's not enough! What more do I need to know? ​Soprano ukes typically have 12- 15 frets. The fretboard is more compact, because the instrument is smaller. I have small-normal sized hands, so I've never had a problem with the closeness of the frets. I do have friends that prefer a larger version, due to the fact that their big hands have a hard time hitting the right frets. Best thing to do? Give one a try and see what is the right fit for you. Check out our article with all the Coustii recommended ukuleles at Types of Ukuleles﻿. If you think ​the length of 21 inches for the soprano ukulele isn't small enough, take a look at sopranino ukes, also called "pocket ukuleles." They are usually only 16 inches or less. I personally don't prefer the sopranino, because of the lack of power in their sound. Sam Kamaka Sr. invented the pineapple ukulele. They are typically the same size, but have the waist of the body taken out. This creates more space in the hollow part of the body, producing a fuller, louder sound. They are also easier to make, because manufacturers don't have to bend the sides of the wood. To the left is a Kala MK-P Makala Pineapple﻿ Soprano ukulele. ​This uke is known for it's less expensive price, without skipping on quality and sound. I typically see ukulele teacher recommend this uke to their students. Another alternative to the soprano ukulele is the long neck soprano. Still the same body size, but a longer fretboard (same size/length as a concert ukulele fretboard). Long neck sopranos have a brighter projection due to the extra length and there is a little extra wiggle room for those with large hands. If you're looking for a soprano ukulele with a little more pizzazz, check out the Luna Tattoo Soprano. This mahogany model gives you deeper tones and sings with higher frequencies. The rosewood bridge makes it easy to hold and play. This bad boy is no generic ukulele! With high quality tonewoods you're ears and heart will be happy. The shark inspired design etched on the body will be a conversation point for admirers. Inspired by both waves and shark teeth! Who are some famous soprano ukulele players? ​Herb Ohta, or Ohta-San, was born in 1934 in Hawaii. He began playing the ukulele at a very young age and was taught by his mother. Ohta-San is known for being a very diversified ukulele player. I had a hard time finding a good quality video of Ohta-San playing, but one of the best of this ukulele master is below. Eddie Kamae is an ukulele virtuuso, which means someone that is very skilled in their musical craft, in this case the uke. An interesting fact I found about Eddie is that his first uke was given to him by his brother who found it on the bus. Eddie is one of the founding members of Sons from Hawaii. ​Not only is he awesome at the ukulele, but is a singer, song writer, and film producer. Talk about a Jack of all trades! Below is an interview with Eddie. There you have it, that's the 411 on soprano ukuleles. Now you know everything from the sizes to the most famous soprano ukulele players. All that's left to do is pick up yours and start strumming! FREE Guide Reveals the Secrets to Learning the Ukulele Fast!